A gag reflex is a contraction of the muscles in the back of your throat that occurs when an object touches your tongue, tonsils, the roof of your mouth, or the back of your throat. It helps to prevent choking to expel objects from the throat to the front of the mouth. For some, triggering the muscles can occur with even the slightest touch, which can make it difficult for you to see your dentist. If you find yourself among the 15% of adults who have a hypersensitive reflex, your dentist in Fayetteville, NC can help you keep your oral health a priority by stopping the reflex with IV sedation. 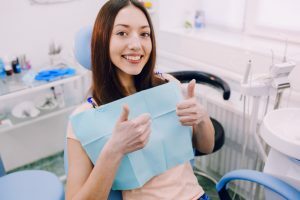 Often, IV sedation is used for those who have dental-related fears or need to undergo an invasive procedure; however, it can also help those who have a strong gag reflex. By delivering a sedative intravenously, it will help you reach a deep level of relaxation to diminish the reflex. You will likely fall asleep during your appointment, so you will not even remember it. This allows you to benefit from a comfortable experience while providing your dentist with the opportunity to give you the care you need to keep your teeth and gums healthy. By choosing a qualified sedation dentist, you have nothing to worry about during your appointment. They are specially trained to safely administer the sedative. With the use of an IV, it gives them the opportunity to control the amount that is administered to cater to your individual needs. When your cleaning and checkup are complete, you will easily be awakened after the sedative is stopped. You may be a bit groggy, so you will need a friend or loved one to drive you home. By the end of the day, the effects will have worn off, so you can go about your day. Invest in Your Oral Health Today! If you have been avoiding your dentist due to your strong gag reflex, now you can keep your oral health a priority. Find out if IV sedation is the right choice for you today! Dr. Angela C. Ruff provides complete dental care to the community. With a focus on patient comfort, she can help those who have unique circumstances get the care they need. If you have a strong gag reflex, she can help you relax. Contact our office today to learn more about the benefits of IV sedation.